Betsy Casey, right, program manager of Summit County's Building Hope initiative, holds back tears during a discussion on suicide prevention with Tamlin Hall, director of the film on the subject, "Holden On." Casey lost her mother, longtime Summit County local Patti Casey, when she took her own life in January 2016. 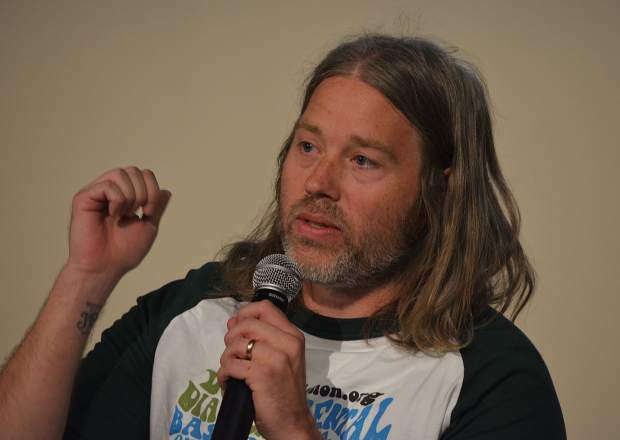 Tamlin Hall, director of the film "Holden On," speaks during a panel discussion about suicide prevention and mental health at the Breckenridge campus of Colorado Mountain College on Saturday, Sept. 23. Later that night, Hall was honored with the best director award at the 37th annual Breck Film Festival. 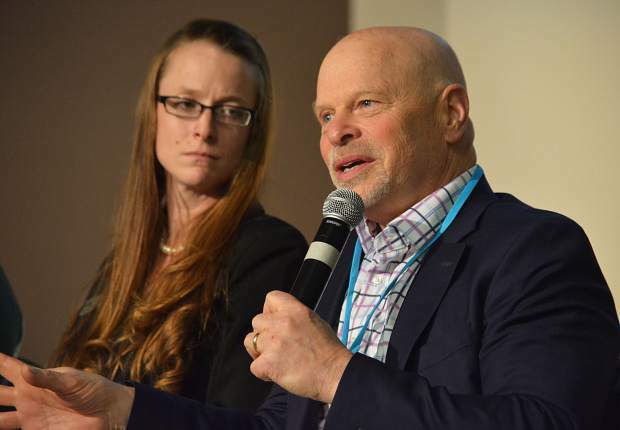 Dr. Jules Rosen, right, chief medical officer of behavioral health group Mind Springs Health and the West Springs psychiatric hospital in Grand Junction, discusses depression during a panel discussion in Breckenridge. Betsy Casey, of Summit County Building Hope initiative, looks on. 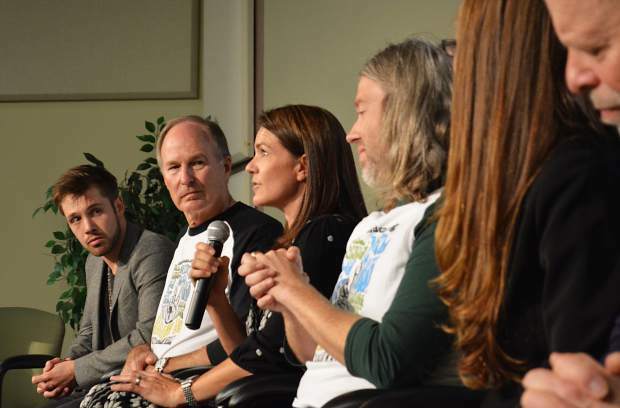 Following a block of two films, "#will" and "Holden On," at the 37th annual Breck Film Festival, a panel discussion on mental health and suicide prevention took place on Saturday, Sept. 23, at the Breckenridge campus of Colorado Mountain College. September is National Suicide Prevention Awareness Month. 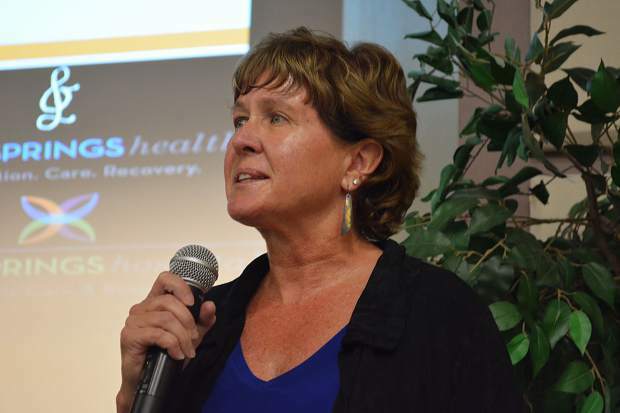 Sharon Raggio, president and CEO of Mind Springs Health and West Springs pyschiatric hospital in Grand Junction, speaks before a panel discussion on suicide prevention in Breckenridge on Saturday, Sept. 23. 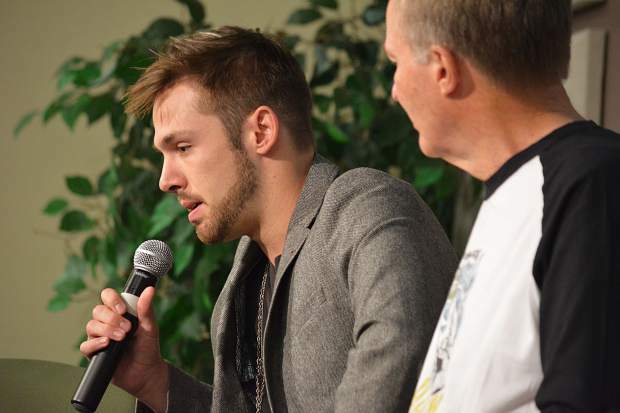 Actor Matthew Fahey, who plays Holden Layfield in "Holden On," spoke in Breckenridge following a presenation of the film during a panel discussion about suicide and mental health, with Layfield's father, Bob, looking on. On Saturday, Fahey took home the best actor award from the 37th annual Breck Film Festival. Betsy Casey, program manager of Summit County's Building Hope intitative. The Summit County native helped found the mental health organization after her mother, longtime local Patti Casey, took her own life in January 2016. 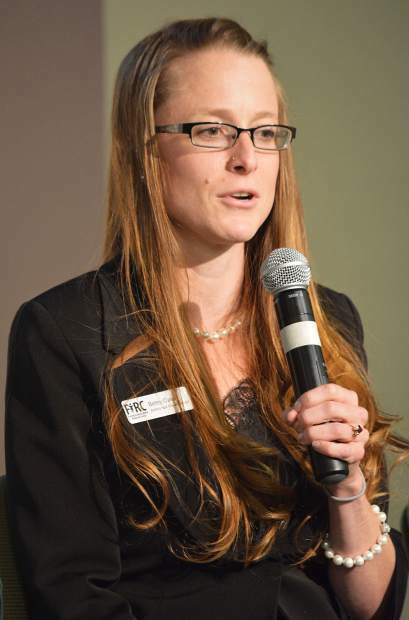 Gemma Taylor, center, a behavioral health therapist with the Summit Community Care Clinic in Frisco, speaks during a panel discussion on suicide prevention on Saturday, Sept. 23, in Breckenridge. From left to right: actor Matthew Fahey, Bob Layfield, "Holden On" director Tamlin Hall, Betsy Casey and Dr. Jules Rosen also took part in the panel. 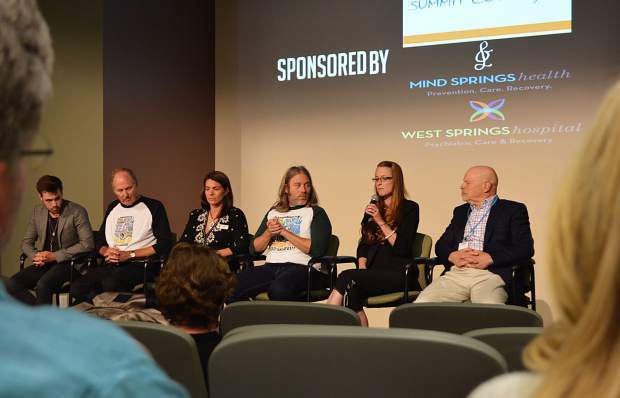 Summit County’s suicide rate has now risen to three times that of the national average, and that has local groups banding together to locate ways of expanding access to care and generating more dialogue around the growing trend. The county experienced an all-time high last year of 13 instances where someone took his or her own life, and there have already been a number of occurrences in 2017, too. The reasons vary, but the fact is the issue remains an increasing priority for the community, particularly with September representing National Suicide Prevention Awareness Month — as well as one that won’t disappear overnight. 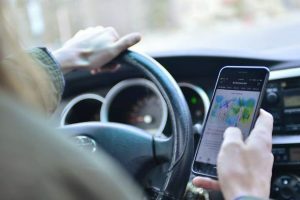 That list includes increased levels of transience, which can geographically isolate an individual or family from their usual support network. 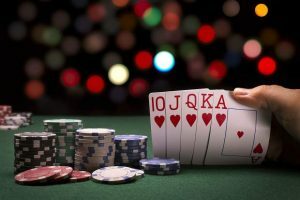 The high cost of living often adds another layer of stress with the need to maintain multiple jobs just to get by, and studies are ongoing on the science behind potential impacts from extended periods living at altitude. 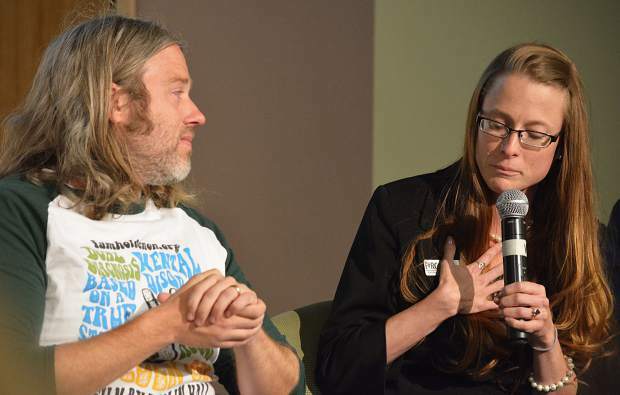 There was nary a dry eye Saturday afternoon in the auditorium of Colorado Mountain College’s Breckenridge campus following the combined two-plus hours of screenings. Both narratives are based on true stories and depict high school-aged protagonists struggling to fit in one way or another as they tried to settle on life’s meaning and purpose. Each ultimately settled upon self-destruction. Into Building Hope’s second year in existence, Casey has made it her personal mission to lessen stigma concerning behavioral health in the community in which she grew up — and that also saw her mother Patti fall victim to the borderline local epidemic in January 2016. The agency, housed at the Family & Intercultural Resource Center and founded with the assistance of nonprofits like The Summit Foundation, also makes minimizing barriers, offering trainings and helping those showing warning signs get proper treatment chief among its goals. In “Holden On,” actor Michael Fahey plays Holden Layfield, a teenager in the mid-1990s in LeGrange, Georgia, and friend of writer and director Tamlin Hall. The lightly populated city — roughly the size of Summit County at 30,000 people — ends up providing inadequate care to Holden, who develops schizophrenia, and his parents Bob and Brenda, who attended Saturday’s screening, are left with few answers for how to support their beloved child. 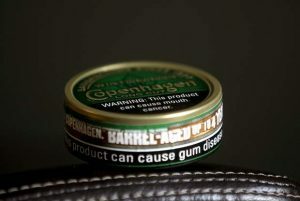 Desiring not to let the story of Holden, the typically congenial friend and son who classmates voted the high school’s friendliest senior, go untold, Hall approached the Layfield’s about producing the film. Today, the enterprise is helping create conversation among adolescents nationwide as part of the effort to comfortably talk about suicide prevention. Area mental health professionals noted how well the film, as well as Fahey’s depiction, humanized mental illness, in addition to the realities of current deficiencies in the health care system. In turn, it requires a communitywide approach to helping individuals and families overcome these medical obstacles. Spreading the word that these illnesses can be addressed through treatment is part of the challenge, and the focus of the work presently at hand. It’s through this local unwillingness to prolong silence and misunderstanding of mental health issues that Summit plans to press on toward solutions for its escalating suicide rate.